S.T.A.R.T is a program that turns a crazy puppy into a super puppy. It is not designed to teach you ‘all about training.’ But to help your puppy learn to be good, and teach you how to prevent bad behavior without a lot of commands and training you will never use. Fill in the form on this website or call 519-902-4739 to start your puppy this week. We welcome puppies after their second shots – but we encourage you to wait until their third shots. Puppies are susceptible to parasites, parvo virus,coccidiosis, and other potentially fatal, and definitely vet-expensive problems. While we work hard to ensure our training facility is cleaned (using the same cleaner as the vet offices use) we cannot guarantee that your puppy will not encounter parasites and pathogens on its way to training. If you are not satisfied with our training method after the first night we will offer a full refund. Puppy socialization should be designed to create confident, happy, well socialized puppies who are easy to train, and fun to play with. 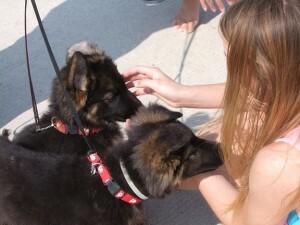 We work hard to make sure each puppy is ensured a happy, positive experience. We will customize this program to correct the problems you are facing. You will learn the foundations for training a dog, so that all obedience training is easier and more fun. Our main goal is to create a confident, engaged, and ‘family friendly’ pet. 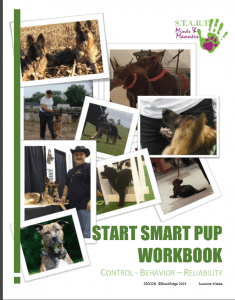 You can continue taking the course until you have ‘succeeded’ in helping your puppy learn not to jump, bite, run away from you when off leash, and walk with you on a leash. Note: This course is designed to give you the tools needed to either socialize and set the foundation for successful dog training. It is not a training course. We have successfully fixed 1 behavior problem in this course. Often the tools needed to fix this one problem gives you the tools to fix others. If you need more help please start with the ‘No Hyper Puppies!’ program on this page. _Some younger/immature puppies may be allowed to stay in great beginnings for an extra 2 weeks. Congratulations on your new puppy. Bringing home a new puppy is a wonderful experience. With a good start, puppies can grow to be an important part of your family who bring love, laughter, and pride for many years. This is a puppy version of our S.T.A.R.T obedience course. It is designed to teach the same basic commands as a regular obedience course, but focusing on positive reinforcement and teaching your puppy to obey you as a ‘behavior’ that lasts a life time, not a ‘trick’ that he does for a treat. Note: our focus is not precision or perfection. It is teaching your dog to want to obey you, and having the skills needed so that you can enjoy life with your dog including safely going for walks, inviting people to your house, and taking your dog when you leave home. S.T.A.R.T – No Hyper Puppies! Teaching the puppy to come when called – every time. 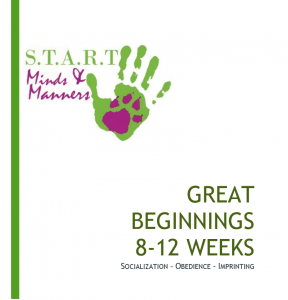 Note: if your puppy does not progress as you wish then you may repeat this course in the adult S.T.A.R.T. program whenever it is running.